It's pouring rain when I arrive in San Francisco, but that doesn't deter me getting out into the city to make the most of my short stay here. 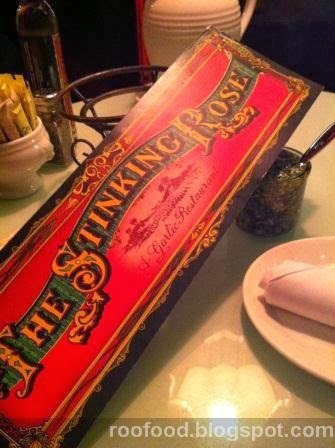 I purchase an umbrella at a local department store and head off through Chinatown to Columbus Av to find the (in)famous The Stinking Rose restaurant. A restaurant that is dedicated to the pungent bulb. I'm seated at a little nook of a table for two near the window, offering a wet view. I feel all warm and cozy inside. The aroma inside the restaurant is warming and comforting. I start out with bread and the house relish, The Stinking Rose Garlic Rose Relish. 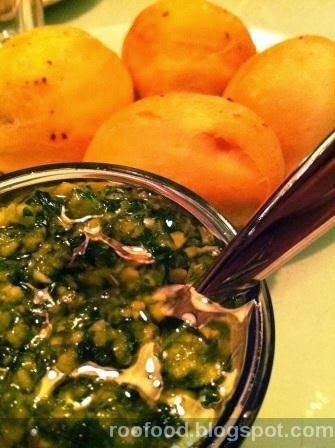 Olive oil with parsley, garlic and vinegar. The garlic is raw in this relish and it's very sharp and garlicy hot. I'm addicted to it, conscious of not filling up on bread, but can't help myself. I eat tablespoons of the stuff. It reminds of aglio olio. 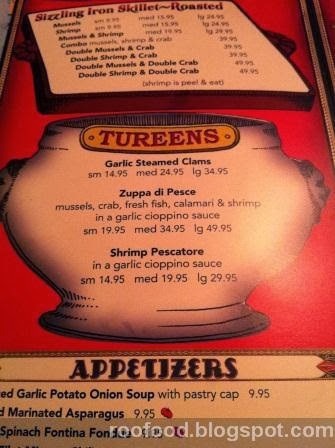 The menu is oozing garlic based dishes. The great thing there are many dishes that aren't overpowering with garlic. There are some that just have garlic in it and not as a main flavour. 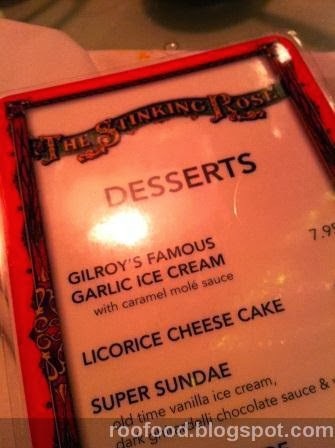 Phew...so much garlic is going to have effects and I'm glad I'm not going to be kissing anyone tonight! 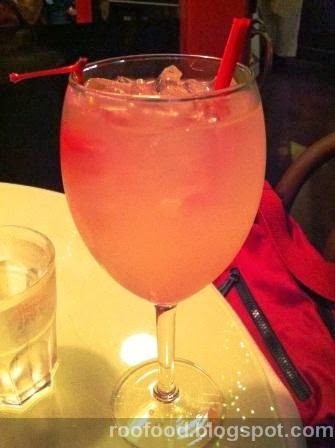 I may ward off a cold.........or a vampire or two! 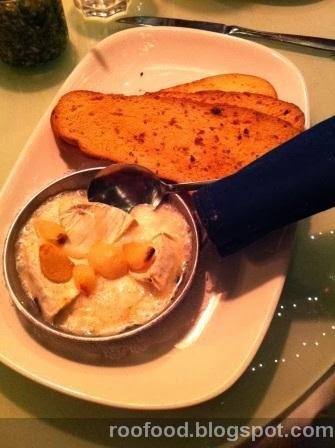 For starters I choose the Roasted Garlic Baked Triple Cream Goat Brie with toasted chiabatta. 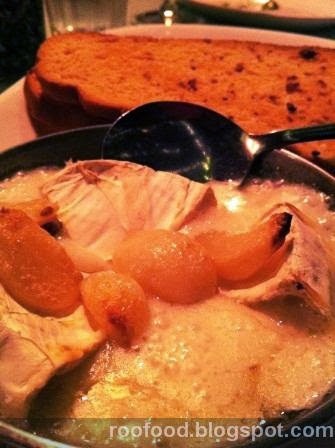 The skillet is piping hot and the brie is oozy and melted with whole roasted garlic bulbs. Oh yeah, this is what make a cheese go to another level! 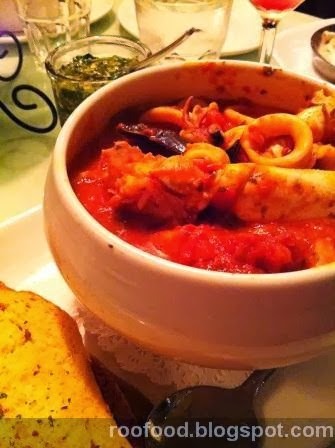 For main I go with a tureen of Zuppa di Pesce, which has plump mussels, sweet crab, fresh fish, calamari and shrimp in a garlic cioppino sauce. 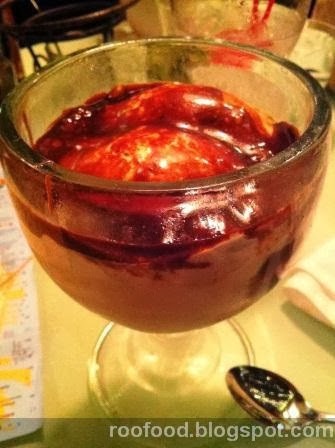 I do however need to try the garlic ice cream with caramel mole sauce for dessert. There is always room for icecream. It's an odd combination and the garlicy creaminess grows on me. The caramel mole sauce is good. There is a definite hint of garlic with every spoonful. 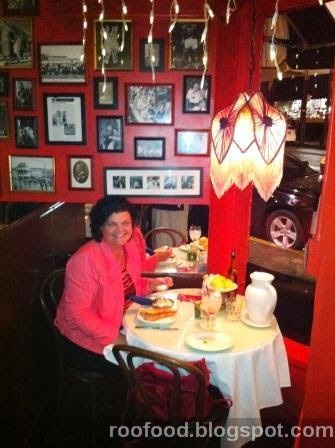 I loved this restaurant. 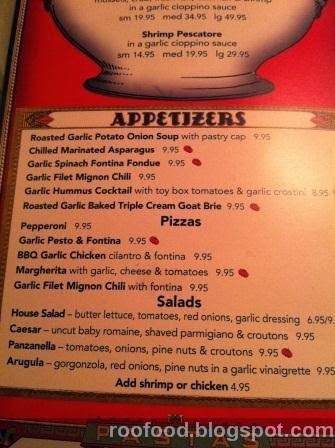 The food was good and the novelty of a garlic restaurant is fun. Of course you can purchase souvenirs from stickers to cookbooks to glassware. By the time I was leaving I could smell the garlic on my own breath and found myself offensive! P.S. Leftovers the next day (for breakfast) were extra fabulous!